In the latest Nintendo Direct it was announced that A Link Between Worlds will have a StreetPass function that when activated will allow you to play other playerswho you StreetPass. 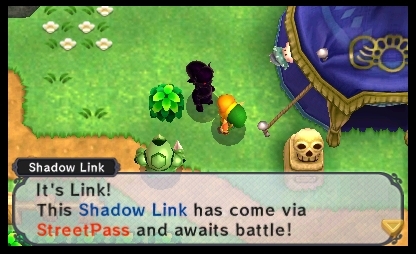 You must create you own Shadow Link and give them 2 items for use during battles. After doing so the player can find others Shadow Links and choose to fight them. You will pick 2 items to go into battle with and upon winning - Link will recieve a Bounty full of rupees and even an occasional reward with the new award system depending on the items used during battle. So what do you think about the latest feature in A Link Between Worlds?